Benefit from our column-based cell isolation technology using nano-sized beads for positive cell selection or cell depletion of virtually any cell type from any cell source. Benefit from our column-based technology using nano-sized beads for positive cell selection or cell depletion from any starting material, including peripheral blood mononuclear cells (PBMCs), whole blood, bone marrow, leukopak®, and buffy coat. Column-based MACS Technology allows for minimal cell labeling with nano-sized beads. Minimal labeling preserves cellular integrity and characteristics. MACS Column-based technology owes its longstanding success to the combination of superparamagnetic nano-sized beads and a very high magnetic gradient in our MACS Columns. This combination allows for minimal labeling of target cells and therefore preservation of cell integrity and characteristics. 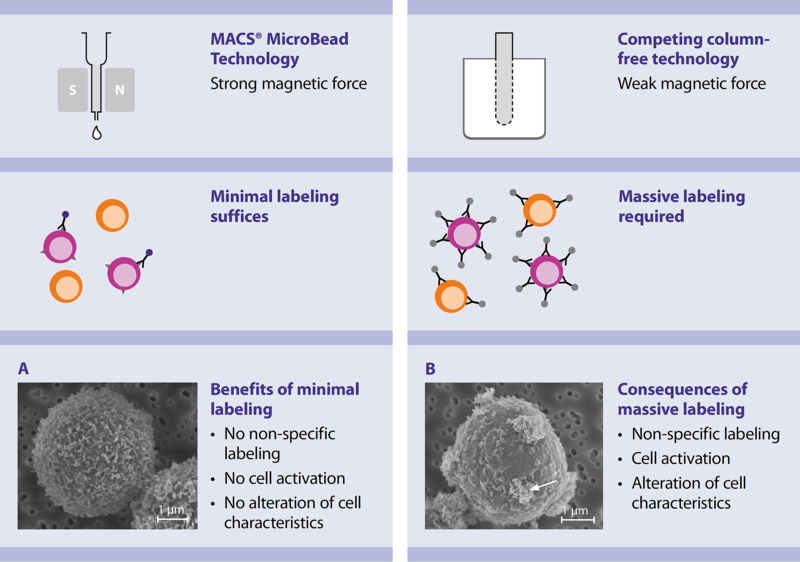 MACS MicroBeads are biodegradable and compatible with all downstream applications, including cell sorting, flow analysis, cell culture, functional assays and molecular analysis. 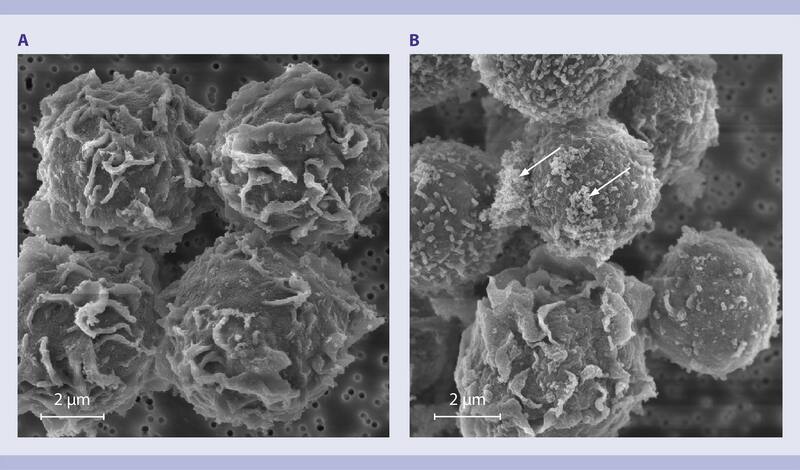 Human PBMCs were labeled with MACS MicroBeads for the isolation of monocytes with a MACS Column (A) or with other nano-sized beads for column-free isolation of the same cell type (B). Scanning electron microscopy showed no visible labeling on cells or alteration of the cells‘ appearance when the cells were isolated with MACS MicroBeads. In contrast, cells isolated column-free with other nano-sized beads showed massive labeling (indicated by arrows) and an altered visual appearance. MACS Technology minimizes epitope blocking and cell activation. The high magnetic gradient generated by the matrix in the MACS Column allows for minimal labeling of target cells with nano-sized MicroBeads. This ensures that plenty of surface epitopes remain free for subsequent fluorescent staining and flow cytometry analysis. CD138+ cells were isolated from 4 mL of whole blood with CD138 Whole Blood MicroBeads and a MACS Column (upper right) or other nano-sized beads and a column-free method (lower right) according to the manufacturers’ instructions. The original whole blood sample (left) and isolated cells (right) were stained for CD45, CD19, and CD138 and analyzed by flow cytometry. 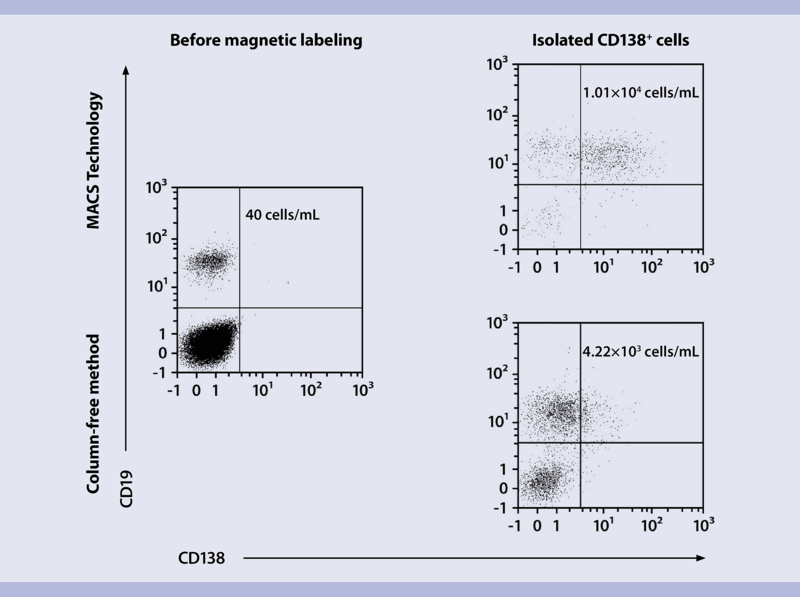 Only the cells isolated with MACS MicroBeads could be analyzed reliably for CD138. Depletion with MACS Technology ensures isolation of truly untouched target cells. Depletion of unwanted cells with MACS MicroBead Technology is an elegant way to obtain pure untouched target cells. Minimal labeling of unwanted cells with MACS MicroBeads avoids non-specific labeling of target cells, leaving target cells truly untouched. In contrast, column-free methods using nano-sized beads require high concentrations of labeling reagents thus risking non-specific labeling of the target cell fraction. Monocytes were enriched by depletion of unwanted cells using the MACS Monocyte Isolation Kit II, human or a column-free kit for human monocyte isolation from another manufacturer. Subsequently, monocytes enriched with the column-based (A) or column-free (B) isolation method were stained with CD14/CD16 antibodies (red) and Anti-Dextran antibodies staining nano-sized beads (green) for immunofluorescence microscopy. 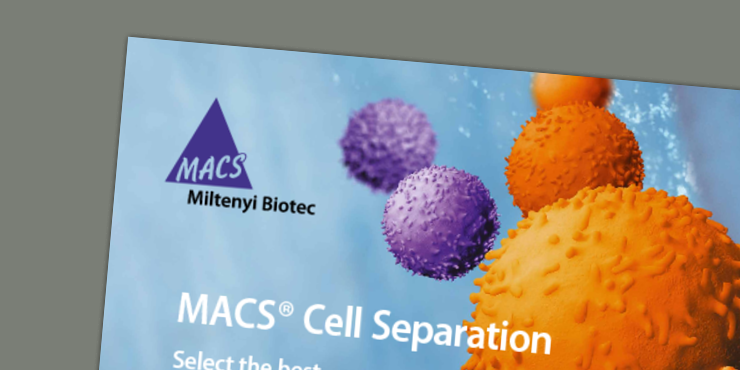 Download our MACS Cell Separation brochure and learn more about MACS Technology cell isolation solutions.